Most NYC area PBL’s also were early and enthusiastic Fishbowl customers. Traditional GM loyalist FACCO took 70 TDH-5301’s in 3 orders during 1960: FACCO 1-10 (built in January 1960) were equipped with factory air conditioning, while FACCO 3101-3110 and 3111-3160 were built in January and October 1960, respectively, and did not have A/C. They were painted in FACCO green and cream, lacked both “Michigan Markers” and side directional signals, and had small manually-operated side destination signs installed in the curbside standee window strip above the first right side sliding window. They also had push-type exit doors and used split front destination signs: the curbside portion showed the number and route in white-on-black graphics, while the streetside portion showed the destination in white-on-red graphics (an arrangement used on later NYCTA and MaBSTOA GM and Flxible New Looks)., Controlled by FACCO since 1956, Surface Transit also bought 50 TDH-5301’s in October 1960. Numbered ST 3161-3210, these were virtually identical to FACCO 3101-3160, right down to the green and cream FACCO paint job (in sharp contrast to the traditional red and cream color scheme normally used by Surface). 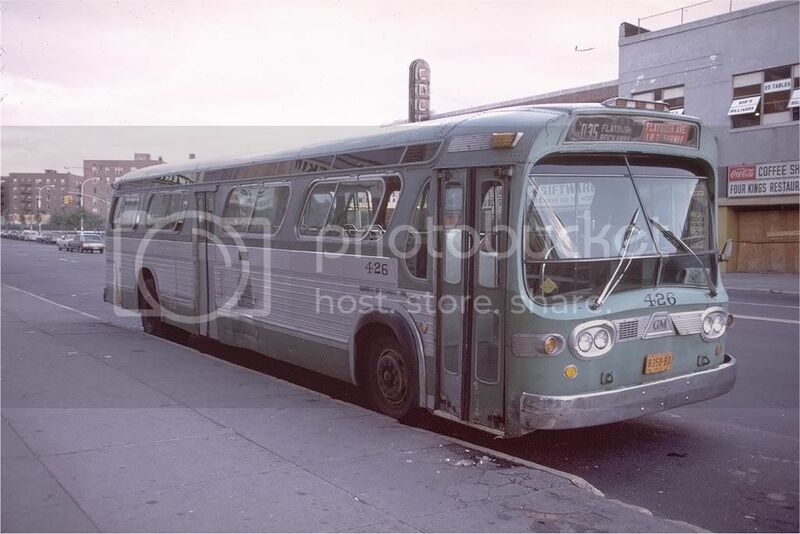 Triboro Coach Corp. became one of only 3 NYC area operators to purchase the 96” wide TDH-5302: TCC 731-740 were built in April/May 1960. TCC also purchased 45 TDH-5301’s in 5 groups: TCC 751-770 (June/July 1960), 771-786 (October 1960), 787-790 (November 1960), and 795-799 (August 1962). These non air-conditioned units had push-type rear doors and were delivered in standard TCC rust and cream livery. They lacked both side destination signs and side directional signals, and were equipped with Signal Stat hand-operated turn signal controls. Unlike contemporary NYCTA Fishbowls, they were equipped with front and rear “Michigan Markers”. Green Bus Lines was a very loyal GM Old Look customer, and they also bought 40 TDH-5301’s: GBL 401-410 in July 1960; 411-420 in October 1960; 421-430 in June/July 1961; 501-510 in June 1962. 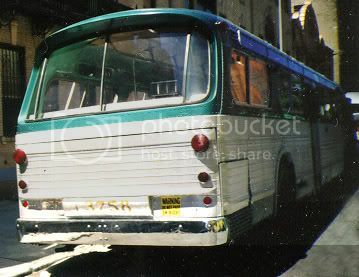 The GBL units were delivered in a 2-tone light green livery, and were equipped in much the same manner as the TCC units, except that the GBL buses used beehive-type side directional signals that may have been actuated by foot-operated controls. Queens Transit Corp. also bought TDH-5302’s; QTC 901-925 were built in April/May 1960. They had the smallest TDH-5301 fleet with 27 units: QTC 926-945 (built in April 1961) and 946-952 (built in August 1961). QTC’s units were delivered in a solid orange color scheme with black lettering, later changed to the more familiar orange and cream livery. They were equipped similarly to GBL’s units. QTC used both beehive and armored rectangular side directional signals that were foot-operated. Like their Old Look predecessors, early QTC Fishbowls had Grant fareboxes and dark green soft upholstered seats in a 2-and-2 arrangement fore and aft. In the late 1960’s, aqua-colored fiberglass 2-and-2 seats were installed to fight vandalism. Sister company Steinway Transit Corp. preferred short, narrow transit buses, and became one of only 2 NYC bus operators to purchase 35-foot New Looks: STC 401-420 were TDH-4517’s built in February/March 1960. They also bought 10 TD-5301’s (STC 521-530) built in August 1961. Long-time Mack loyalist Jamaica Buses Inc. did not purchase any TDH-5301’s, but they opted instead to buy 10 TDH-5302’s (JBI 701-710 built in April/May 1960). Likely were delivered in the red and cream livery of the period, they would be JBI’s only New Looks for several years. New York Bus Tours (predecessor of New York Bus Service) was an early purchaser of GM suburban Fishbowls. They ordered 5 SDM-5301’s (NYBT 233, 234, 236, 240 and 241) from 1960 to 1962; they also acquired a number of second-hand SDM-5301, SDH-5301, and TDH-5302 units. 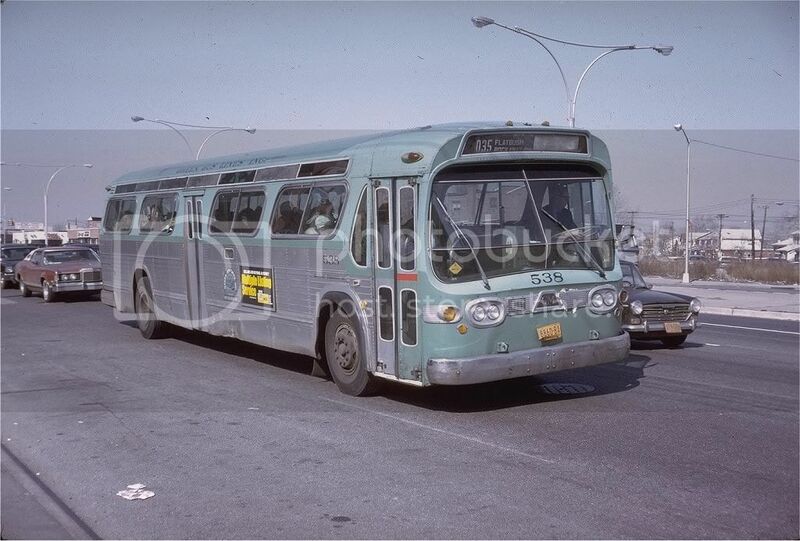 Avenue B & East Broadway Transit, a diehard Mack loyalist, did not buy any new first-generation GM New Looks, but they did purchase 9 ex-Rochester (NY) TDH-5302’s in 1976. They were painted in Avenue B’s red and cream livery (complete with keystone decals), but these units were out of service by 1979, and did not survive to see the MabSTOA takeover in 1980. 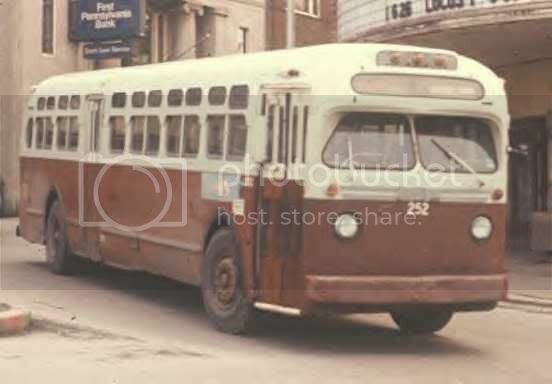 Pictured below is fleet # 426 - a 1961 GM 'New Look' model TDH 5301 and one of 10 (421 to 430) delivered to Green Bus Lines, Inc. of Jamaica, NY over July and August of that year. Notice the very smart and well designed Art Deco style side markers that were replaced with non-descript bullet shaped fixtures on later models (definately a mistake!). Photo borrowed from Bus Talk Galleries for educational purposes only. Thanks for the interesting information, Bob, and the photo, Mr. Linsky. I wasn't too happy when these buses first appeared and started taking over runs held by my beloved Old Looks. However, they look good now, especially compared to the box-buses of today. I would agree with you on 'New Look' first impression and I spelled out my feelings in a thing called 'My First Look at a New Look' elsewhere on this channel. A lot of operators weren't too happy with them either in the beginning just as they shunned the RTS's initially, but the New Looks sought of grew on you and certainly made their mark with the thousands manufactured during their nearly 30 years of production! Thanks for the compliment on the photo. Pictured below is fleet # 538 - a 1964 GM Model TDH 5303 (ser# 1914) delivered to Green Line in May of that year. Notice the disappearance of the wonderful Art Deco markers, the 'any port in a storm' front door slat replacement and the over stuffed floor vent (not exactly what Green Line S.O.P. used to be!). Something else I noticed that's very interesting; the transom or standee glass above the first window has been shortened and not by the factory as is noted by the metal patch - I wonder why! I heard (or read) that the standee window was shortened for structural reasons. Supposedly, the longer standee windows on first generation fishbowls made them prone to the front end sagging. That wasn't the only fault glass wise with the 'New Looks' when they first appeared in 1959. If you will remember, the non-air conditioned jobs came through with a three piece rear window consisting of a vey large single plate in the center and a narrow glass on each side. The problem started with the large pane almost immediately with huge cracks running diagonally from top to bottom. Speculation had it that stresses that were overlooked by the designers were the culprits. The fix, which worked perfectly, was a new two piece center section with a rubber molding dividing the glasses down the middle. On the air conditioned models, the center glass was much smaller vertically and encountered no problems. 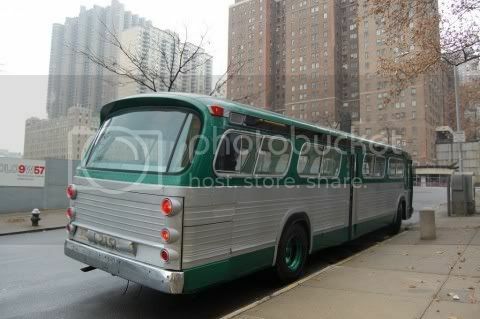 I have attached photos of NYCTA buses with and without repair molding. Photos courtesy of BusTalk Galleries. I think that GBL may have been among the earliest adopters of the 4-piece rear window design on their early Fishbowls. QTC took a while to catch on, but eventually they did likewise on their GM New Looks. Another QTC custom was installation of small, rectangular convex outside rearview mirrors (mounted to the leading edge of the entrance door). I would assume that standard RH mirrors often were broken by tree limbs and other obstacles located near bus stops, while these more compact mirrors survived longer. I have a theory about the structural problems that the 'New Looks' encountered in the beginning now that I've discovered the shortening of the standee glass at the front door (and I would presume on the opposite side as well). I believe the roofs on these buses must have 'shimmied' due to lack of sufficient support. If you consider the glass area openings on a typical New Look you have to believe that they are at least twice or more than those of a straight or paired window 'Old Look'. Additionally, what side supports there are on a New Look are angled to accomodate the 4104 style slanted window configuration. The transom patch, which is visible on GBL #538 above, probably covers an additional steel roof stabilizer connected to the floor on both sides. They may have done the same fix in the rear as well but I have seen no evidence of that thus far. A shimmying roof would unquestionably have caused the rear plate glass to crack! Using the picture below (which, coincidentally!, happens to be an ex GBL 5106 operating for Red Arrow in Pennsylvania) you can see how much more well supported the roof elements are. Bob, take note of the gadget attached to the rear slats of the front door - I believe it is a mirror similar to what you describe as used by QTC but I don't understand how it works with its brackets seemingly attached to the door itself. While we're on the subject of glass problems, the 'New Look' rear plates were not GM's first trip down that road! It was 1954 when the company introduced 'panoramic' or 'wrap around' windshields on most of its auto lines. Complaints began to pour in almost immediately concerning severe cracks that developed any time a vehicle was jacked up for tire service. The conclusion, of course, was that stresses placed upon the body trasferred to the windshield which was not strong enough to take the pressure. The fix, if that is what you would have called it, was advice to all owners and service departments that these cars be lifted only from either the front or rear centers or on appropriate full lifts. The 'wrap around' windshield is a most prominent feature of the '57' Cadillac Limousine pictured below. Photo borrowed for educational purposes only. Loved those wrap-around windshields! BTW, that looks just like the '57 Caddy limo my Dad drove for several years. Long and black! That is particularly the reason that I used the 57 as sought of a rememberance for you. The idea of the wrap around windshield was an attempt to move the front roof supports further to the side to give a better field of vision - in those days the supports were very thick and they did create a 'blind spot' especially on the driver's side. Glad you enjoyed the picture. Thanks, Mr. Linsky, that it did. I once had a '57 Chevy that also had that feature. I sure liked the way those windshields looked. Didn't know anything about the cracking problem. Going back up a few photos, I don't remember the PD-model buses that had similar rear windows to the fishbowls that had dividers, or at least not the center divider. Wonder what the difference was? If you're referring to the PD 4104 and 4106 from which the 'New Look' design was created, there were suttle differences in the rear windows with the PD glass being more perfectly vertical which may have strengthened it. The roofs of the PD's also appeared to be tougher (at least they looked that way!). It may also be that the PD's were of intergral construction as opposed to the monocoque design used in transits. Thanks for your observations, Mr. Linsky. You notice a lot more details than I do! If you will remember, the non-air conditioned jobs came through with a three piece rear window consisting of a very large single plate in the center and a narrow glass on each side. Buses right up to the 1964 orders (165 for the TA [5101-5165] built by Flxible, 325 for MABSTOA [5201-5525] built by GM) were originally 3-piece with regard to the rear window setup. But enough buses were along the way converted to 4-piece, plus bus depot maintenance and repair shop personnel preferring the 4-piece due to their being easier to maintain, and cheaper to replace individual 'split' window panes if cracked, than the 3-piece, that it filtered down to those in charge of ordering new fleets of buses, and so beginning with the 1965-66 orders (190 for the TA [5601-5790] by Flxible, 500 for MABSTOA [6401-6900] by GM), new buses would come from the factories already with 4-piece rear windows. Thus they remained for as long as "fishbowls" were built in such fashion. Including and especially the first AC buses built for both TA and MABSTOA by GM in 1966-67 (the only orders where every bus had the 'batwings').